The Stanford Innovation Review defines social innovation as "...the best construct for understanding - and producing - lasting social change. In order to gain more precision and insight, we redefine social innovation to mean: A novel solution to a social problem that is more effective, efficient, sustainable, or just than existing solutions and for which the value created accrues primarily to society as a whole rather than private individuals." 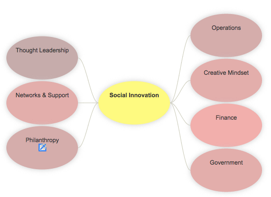 We have started a map of the resources available around this exciting topic and hope to continue expanding and improving this view of the social innovation landscape.